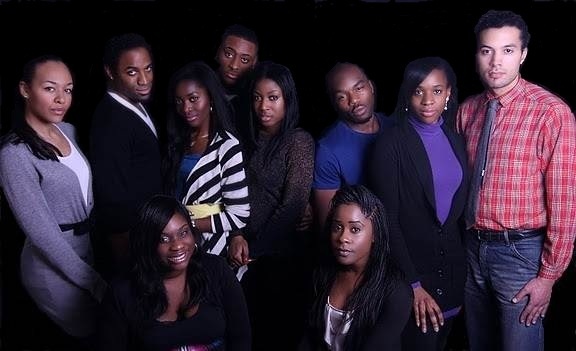 Part of the cast of "Breach"
Last Saturday, DSBC Productions put on a play at the Albany. “Breach”, which is also a web series, is a compelling cultural urban drama about the lives of a group of people who all seem connected in one way or another. The multiple storylines in the play seem to peak through the keyhole of diasporic Afro-Caribbean’s as they battle their way through relationship problems. “Breach” doesn’t seem to concern itself with the potential stereotypes in the storyline, but instead holds true to the drama that results from infidelity and betrayal. What makes “Breach” a more unique drama is one of the leading plots in the play, that of star-crossed lovers from Angola. Played very well by actors George Choat as Lorenzo and Charlyne Francis as Nina, their timing and chemistry brought the characters to life. Ayo Fawole as Issac was another lovely addition to the cast. His presence on stage was felt strongly and his lines were delivered with refreshing confidence and humour. “Breach”, however, is more than what it seems. In many ways, it represents an important contribution to Fringe theatre, which is too often overlooked. Small theatres like the Albany potentially have the freedom to honour storyline’s that give a voice to the diverse population in London. And Breach does this rather well by speaking the language of youth and culture. In the swaying hips of the wonderful Lonette Charles, who played the no-nonsense Nancy, the audience can inevitably witness the strength and vulnerability of London’s wide-ranging ethnicity. It sets itself apart from the mainstream with youthful, raw energy, while adding a touch of a rather clever use of mixed genre. A useful montage of telephone gossip in the play reminds the audience of the production’s dual function as a web series. Fieldmann Robinson as Oliver and Yonah Odoom as Bijou seemed to find new energy in the last half of the play. The men, overall, had a natural quality interacting with rough play, yet including the audience in their mischief. There was a surprising amount of raw talent in the character Junior, who was played by Jonathan Renner, while Mishael Lazarus as Derrick kept the audience chuckling. An Angolan political plot with a forbidden love is a hard sell. The audience is asked to believe that a woman whose love springs from her only hate would actually submit to teaching the son of her enemy. Yet, Francis plays this part with a sort of innocence and nervous intensity that adds credibility to the play and proves that writer, Christine Rugurika, is also a competent director. While the music added substance to one or two scenes, it mostly seemed overwhelming, especially due to the sound technician’s itchy trigger finger. Yet overall, “Breach” with its tangible heat and exploration of generational behaviour, will likely have audiences eager to see Part 2. For more information about DSBC Productions, click here.